Asia produced more than 58% of total acrylic production in 2014. 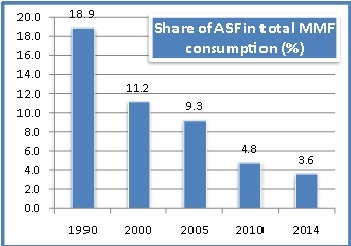 About 60% of world acrylic fibre production is concentrated in Asia, with 35% in China alone. Global acrylic fibre production declined by an average 2% per annum during the last 14 years as demand weakened along the years. Acrylic fibre demand in Asia declined 7% in 2014 to 1.07 million tons and accounted to 52% of global demand.